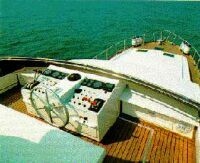 An endless number of definitions were conceived to describe the activity and the yachts built by Cantiere Navale Camuffo, a rare example, in a universe of improvisers, of a family vocation for yacht-building (the first craft designed by a Camuffo sailed in 1438). The latest born in such a large and old yachting family is this superb M/Y C50 FB, conceived with the same passion and the same timbers as ever: but words, as usual, will fall short of all that. We will therefore speak of the insulation, the total absence of mould and odours, the natural power and vigour of a structure that offers extraordinary performance and duration in time and almost genealogical revaluation. These usually are the first "impressions" the journalist has upon boarding and then navigating on board a Camuffo yacht. But this C50FB suggests a couple of other ideas: to those who know the building tradition of the Portogruaro-based yard, this yacht delineates a small/big revolution both for the lines of the upper works and for the layout and the styling of the interior. We therefore asked Marco Camuffo how does he join comfort and performance with a substantial change in the structural bulkheads and a totally different interior layout (saloon with unusual and offset settee; re-designed furnishings and structures, central owner's stateroom and two off-centred and over-sized guest cabins, totally re-designed streamlined coachroof, window-panels and hatches, unusual double forehatches on deck). Performance that we ourselves have verified, which, as shown by the performance and consumption charts listed below, is absolutely extraordinary and over and above associated to excellent comfort, stability and lack of any vibration. This VIP of the yachting community spoke of excellent seaworthiness with greater hull support with offset hull sides to increase the lift of the centre of gravity reminding us that every boat built by Camuffo is a "double" boat, built with two wood "double moulds" that ensure the possibility to completely disassemble the boat with just a screwdriver (there are over 600 components), and so on. 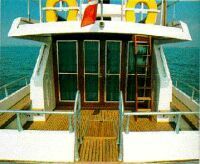 Flying bridge: roll bar, Steering position: complete with all kinematics chain facing settees for six people, teak decking, air-flow deflector. 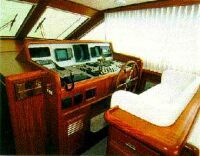 Layout and specifications: saloon with double settee (L-shaped to starboard and straight to port, both convertible, below deck steering position with settee, burr chart table, L-shaped settee and numerous lockers. Galley to port of the ladder leading below to the sleeping area. Guest cabin forward with an upper and lower staggered bunks and wardrobe. 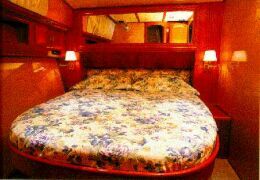 To starbord, a second forward guest cabin with 2 vee berths and a roomy wardrobe. Guest heads aft to port, facing a very spacious wardrobe. Owner's stateroom amidships with double berths and private heads. Crew cabin forward with private heads. Cabin doors with louvers that can be opened for free air flow. Woods: mahogany, khaya ivorensis, light coloured burrs, erable. Galley area: hanging lockers and food locker, 80-litres fridge, cooker ventilating hood, sink, two gas burners and one electric burner stove, other appliances on request. Standard equipment: anchor windlass, Hi-Fi stereo, Kholer generator, boiler, hydraulic lazarette. Docking manoeuvrability: very good, also thanks to the rational and strong docking equipment and to the ample deck room. Electrical equipment panel: designed and built by the yard: a guarantee. 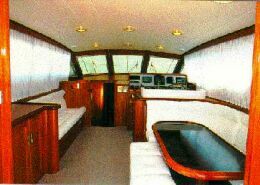 We still do not like the flying bridge seating and cockpit, which are a little too basic, lacking a comfortable settee or a drinking/conversation area. Will the next creature keep this humble remark in mind?